This version of the RMi Series power supplies from corsair comes with a total power output of 750W. The RM750i gives you extremely tight voltage control with near quiet operation. The 80PLUS GOLD rating on this PSU reduces operating costs and excess heat. It also features a fully modular cable set, these DC cables makes building and upgrading your PC easier and leaves it looking great. The Zero RPM fan mode ensures virtual silence at low and medium loads. The RMi Series also features the Corsair Link Digital which makes it extremely easy to monitor the power supplies performance along with toggling single rail or multi rail modes, or controling fan speed directly from your desktop. 750W Corsair RM750i Series Fully Modular PSU, 80PLUS Gold Certified, 135mm Fan, ATX is rated 5.0 out of 5 by 6. Rated 5 out of 5 by Karmazyn from GOLDEN, efficient PSU from Corsair... I really like this PSU. There is lots to like really. You need to have a confidence in your products if you offer 10 years warranty. I will, no dobut, replace PSU by then but the sense of security I have is great. I bought this PSU to replace my dying on me XFX 850W power supply. My XFX started misbeahving after 3 years of usage so I had to find a worthy replacement. I must say that by choosing this PSU over competition was a really good decision. 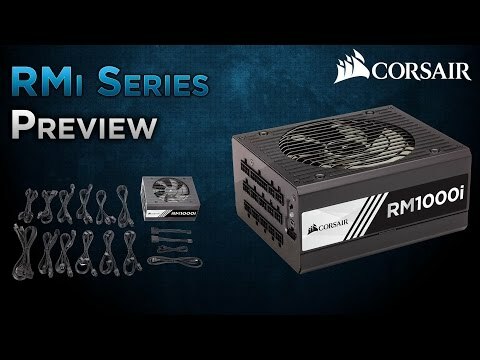 There is not a lot to like about Corsair RMi Series 750W. Efficiency, temperature and noise levels (what noise) are really great. It has digital interface, fan test button, low temps at full power, load regulations, it is SILENT ! , it is fully modular and I really, really like it. I am really happy that I chose Corsair ! I would definitely recommend this product to everyone. Dont save money on PSU ! It is crucial component of your PC. Rated 5 out of 5 by paulj from Well Made and Quiet in use! I bought this to replace a faulty unit previously installed. It comes well packed, and with a good selection of cables (more than I needed!). Because it is modular, it makes for a clean layout as only cables required are installed. Once powered up, the first thing that struck me was how quiet it is in use. The other positive which drew me to this power supply was the warranty period, although I doubt I will need it. Rated 5 out of 5 by LukeB from Superb Great power supply. Extremely quiet even when powering i7 6700k and single 980Ti and Kraken x41. Highly recommended and more than enough power if you're not using multiple pumps and SLI 980Ti / Titan. Rated 5 out of 5 by PsyMonkey01 from Great Power Supply Extremely efficient and very quite. Most of the time the fan is not even spinning. Very happy with this Power supply. Also included more than enough cables for my needs. Rated 5 out of 5 by 1234 from Nice PSU with some good feature, but a pit pricy Comes with Corsair Link which allows PSU temperature and fan speed to be monitored using free Corsair Link software. Fan only comes on when needed. Very quiet. Rated 5 out of 5 by nfxcr3w from Quiet yet Powerful After hearing lots of good reviews about this product. I had to buy it i did own a couple of other Corsair CX Series PSU's which were no so bad but had terrible coil whine. So decided to pay a bit more and get the RMI 750i from Corsair and now im glad i did. No more coil whine so silent. Does get a bit warm though but the fan doesn't spin has it has that Zero fan less mode. all my games run perfect no stutter didn't know how much it made the difference just by getting a better power supply fast delivery excellent service as always. Can't recommend this enough guys its awesome a must have for every pc build.